As the Luce Artist in Residence, Los Angeles-based artist Matthew Brandt was invited to explore the New Jersey landscape and the Newark Museum’s art and science collections to create new work. Combining historical photographic processes with a site-specific, inventive approach to materials, Brandt made several trips to Newark in 2017 and 2018, photographing natural sites throughout the state. While in New Jersey, Brandt visited several of Robert Smithson’s original sites in which Smithson collected rocks and minerals for his “non-site” sculptures. One of the sites Brandt visited was The Pine Barrens, an area rich in silica (a material central to glass production). Brandt wandered and took photographs in and around the area. Also while in New Jersey Brandt learned that the Newark Museum was in the process of deaccessioning rocks from its Educational Loan Collection. These rocks were shipped to him and were grounded up into dust. Brandt purchased leaded glass windows from a New Jersey Ebay seller. The resulting works in this gallery capture the New Jersey landscape as both subject and material, incorporating rocks, glass, and other local elements. 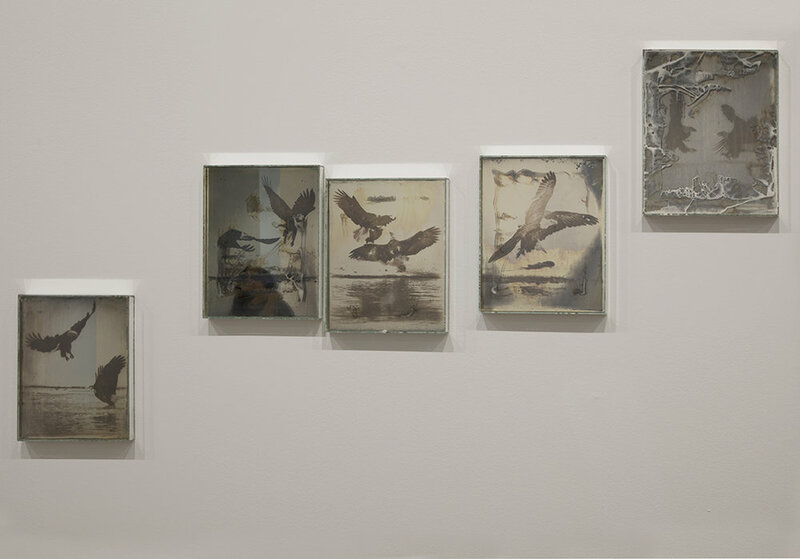 In the main gallery, Brandt has created an immersive installation of 100 daguerreotypes of American eagles, made from glass and melted American Silver Eagle coins. Inspired by the current political atmosphere, these photographs, originally shot in Alaska in 2014, depict bald eagles fighting for salmon.